The idea of the Oort Cloud was first postulated as far back as 1932, by Estonian astronomer Ernst Opik. He thought that there must be an area, right out in the far reaches of the solar system, where long period comets resided, when they weren't entering the solar system. At the time, though, nothing more was made of it. In 1950, this idea surfaced again, this time by Dutch astronomer Jan Oort (who was unaware of Opik's original suggestion). He came up with it because there was something about long period comets that puzzled him. Given that the orbits of these bodies are greatly unstable, it is inevitable that over the millennia, they will either crash into the Sun, collide with a planet, or be ejected off into deep space. As well as this, every close approach to the Sun causes the volatile compounds within the comet to boil off (manifested as the tail), resulting in it eventually either breaking up or ceasing to be a comet altogether, becoming a rocky body. So, he surmised, because comets still appear with monotonous regularity, they must be resident most of their lives in a far outlying part of the Solar System, only venturing sunward when nudged by gravitational effects. This theoretical "cloud" of comets was, therefore, named after him. This graphic demonstrates just how far out the Oort Cloud is - and this is just the inner one! The little red ellipse in the centre isn't even the Solar System; it's the orbit of Extended Disk Object, Sedna. The Solar System itself is tucked away at one end of this ellipse. The Oort Cloud is divided into two parts. The Inner Oort Cloud is also called the Hills Cloud, as it was proposed, by astronomer J. G. Hills, that the cloud may have two distinct sections. It is a huge, donut-shaped area beginning about 2,000 AU from the Sun and extending to 20,000 AU. This part of the Cloud is thought to contain maybe a hundred times as many bodies as the Outer Cloud. Indeed, it is thought that the Inner Cloud keeps the Outer topped up as it becomes depleted. This accounts for its continued existence over the millennia. 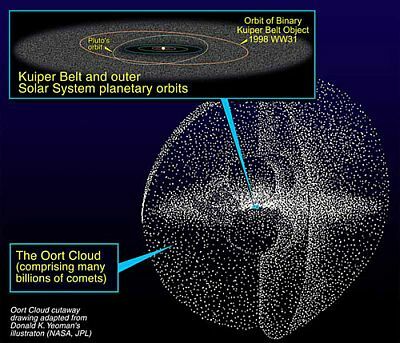 Because long period comets arrive in Earth's skies from all points of the sky (not just along the plane of the Solar System), it is thought that that this outermost section of the Oort Cloud is actually a huge sphere, as shown here. Beginning at 20,000 AU from the Sun and extending out as far as 50,000 AU, it is estimated to contain an many as one trillion icy bodies. As the cloud has never been directly observed, some estimations of its outer limit take it out as far as 3.16 light years. It was first thought that all objects in both sections of the Oort Cloud were made up of icy compounds such as water, methane and carbon dioxide. However, in 1996, the Jet Propulsion Laboratory discovered a rocky object, similar to an asteroid, which had a trajectory like a long-period comet. This enigmatic object, christened 1996 PW, therefore suggests that the cloud my also contain rocky objects. It was once considered that Oort Cloud objects originally coalesced from the original protoplanetary disc that existed before the formation of the planets. At the time, they were much nearer to the Sun than now and were sent into their present location by the gravitational effects of the gas giants. However, more recent research by NASA suggests that, in the early millennia after the Sun's formation, it was clustered together with other young stars and, as they gradually drifted apart, residual material from their gravitational interaction produced the cloud. No-one knows with absolute certainty which theory is correct. As our Solar System orbits the galactic centre, it is effected by a tidal force, in much the same way as our Moon exerts one on Earth's oceans. 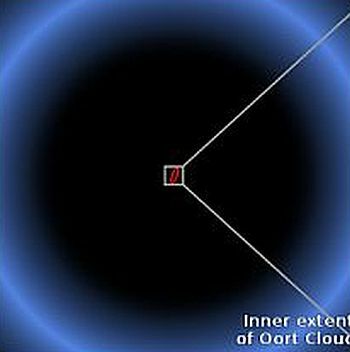 The outer Oort Cloud is so far from the Sun, its gravitational effect is very weak, allowing this tidal force to play a part in the nudging of Oort Cloud objects towards the inner Solar System - manifesting as comets. The cloud's remoteness from the centre of the Solar System even allows the gravitational influence of passing nearby stars to have a similar effect. This is the name given to a hypothetical Jupiter-sized planet in an extremely distant orbit around the Sun. It has been proposed by astronomer John Matese, who suggests that the behaviour of long-period comets can not be explained solely by the galactic tidal force or effects of passing stars. The WISE survey has had part of its mission profile modified towards investigating this and either proving or disproving it.